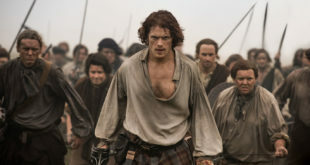 This week on ‘Outlander’: Battle comes to the Frasers at the Prestonpans and they realize war isn’t all glory and heroism. 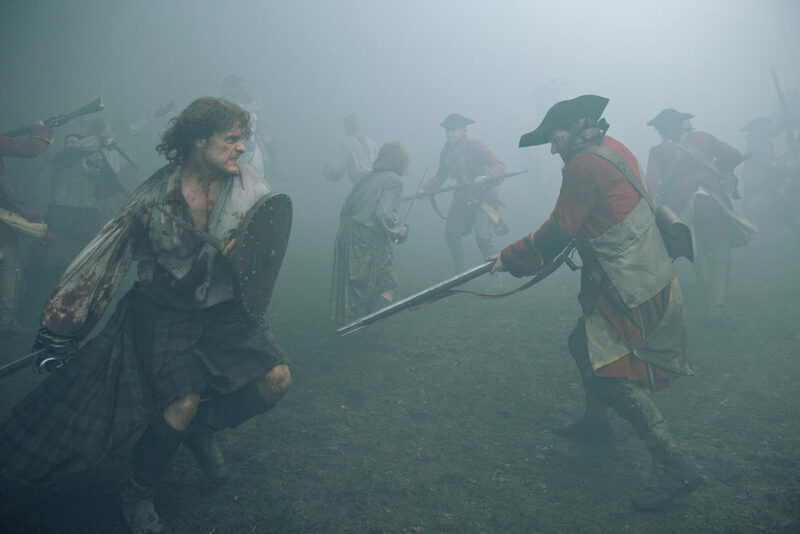 After the season long attempt to stop the Jacobite rebellion, it’s finally here on Outlander. 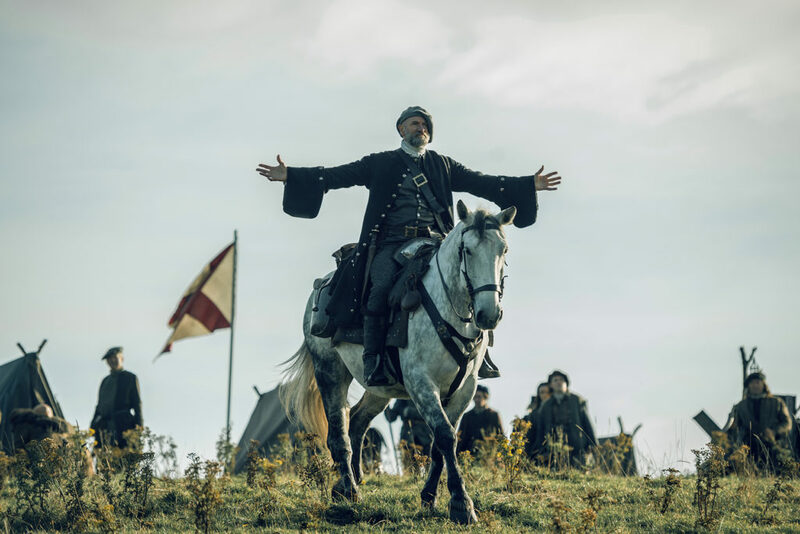 Last week’s episode “Je Suis Prest” was a highlight for me, a slow descent into the madness of war, but this week’s episode, “Prestonpans” displayed more of the action, the battle, and the bitter taste of victory. Jamie has finally met up with the Bonnie Prince Charles and the prince is happy to have Jamie in his employ. Despite Jamie being a lower officer in the Prince’s army, Jamie never holds his tongue where military matters are concerned, and he’s certainly not one to wait around for someone to decide what to do for him. There’s a swamp smack dab between the two encampments and while the highlanders have the good, high ground, they have no real advantage to fire upon the English. The options are to either wait for the English to attack or to try to ford the swamp and be attacked in the process, without knowing how deep the swamp goes. The military leaders continue bickering about the swamp while Jamie leaves to go do something about it. He tasks Dougal to ride out on a horse into the swamp to see if it’s able to sustain infantry. Dougal is all too happy to prove his mettle to the prince and eagerly rides out to meet the startled redcoats. 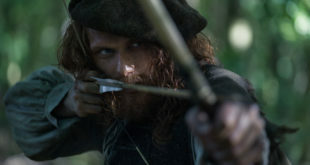 Once in the swamp, the redcoats use him for target practice and their aim at that distance is about as good as stormtroopers, but Dougal presses on, adamant he get a good measure of the swamp’s danger. In the end, after getting his bald head grazed by a musket and stuck for far too long in the mud, he manages to escape and return to the Scottish encampment. The prince awards him with his praise, saying that if he had 100 of men like him this war would be over. Dougal swells with pride. Much like with Colum, it’s all he wants, to be accepted and useful to those in charge. Jaime then receives news from a local Scottish boy that there is an unmarked trail through the woods that leads directly to the English camp. It’s tricky to navigate in the fogs and darkness, but he’s willing to lead a few men down to attack the English at night. Jamie agrees to lead the men himself and soon they are preparing for a nighttime raid on the camp. Claire prepares the infirmary the best she can, making use of the women she has, even though they have little to no experience in medical care. The prince comes to her and says that should she receive English soldiers as patients, she is to treat them first, before the Scottish wounded. They are his subjects, after all, and he wants them to survive this encounter, even though they’re on the wrong side. Claire scoffs at this directive and you can see in her eyes that she’ll disobey that order if it means saving a Scot. But you have to give it to the prince in this moment. He’s not as annoying or ungrateful as he was in Paris. It’s admirable he’d want to protect and save his enemy, even at the cost of losing favor with his own army. At sundown, the highlanders march out for the attack in what may be one of the most beautiful battle sequences I’ve seen displayed on television. It’s not as grandiose as say, Game of Thrones’ “Hardhome”, but it’s stunning. It’s shocking to me that a scene full of so much death and chaos can even be describes as beautiful but there it is. The cinematography in Outlander has always been A+ work, the area where it truly outshines every other show on TV, but with the battle at Prestonpans, even Outlander outdoes itself. 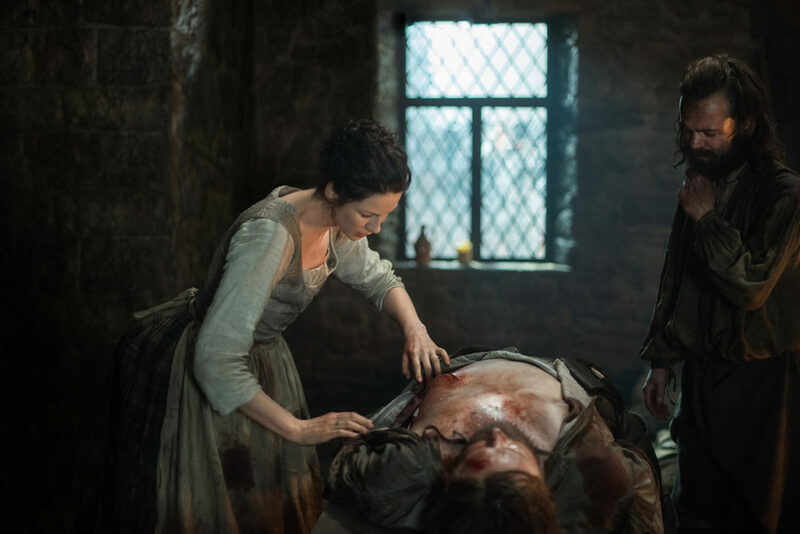 And just as dawn strikes, the wounded come rolling in to Claire’s infirmary. For much of the episode she’s quiet, hardly used, but in these life or death situations is where she, and Caitriona Balfe, shine. She takes control of the chaos the same way Jamie does on the battlefield and the juxtaposition between these two leaders is just another reminder of how much they belong together. She manages to save many lives, including Rupert who took a sword to the gut. But as is the case in war, she also lost friends, unable to save Kincaid, and that is the bitter reality of war. Even worse than the death of Kincaid is the emotional state of Fergus. After sneaking onto the battlefield to try to be a hero, Fergus comes face to face with a man who wants him dead, so he kills him and that act haunts him when he returns to Claire’s loving arms. She doesn’t quite know how to console the poor lad, but she does what any mother does, she loves him, she comforts him. And my god, this may be one of my favorite scenes in the season. Motherly Claire is my favorite Claire. Jamie returns, victorious in battle, and the two reunite, elated the other is physically unharmed. 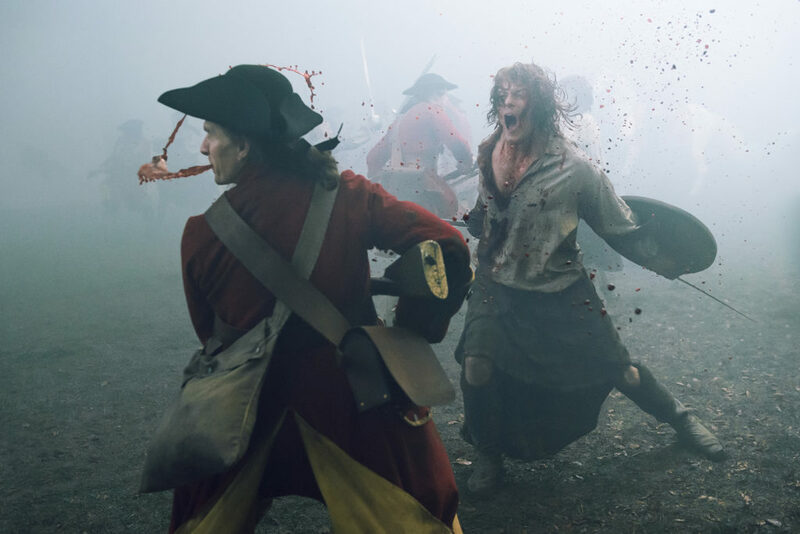 There’s a brief respite from the darkness of the battle when Jamie banters a bit with a few of the injured redcoats in the infirmary and it signals the possibility for reconciliation between these two factions. If Red Jamie, the outlawed Scotsman can get along and joke with injured English, English who hours before would have killed him without hesitating, then there’s hope for the future. But the moment is ruined when Dougal barges in, angry and full of hatred for the redcoats (having just killed poor Lt. Foster in cold blood). He is ready to put down the wounded enemy and is only stopped when the prince comes in and exiles him for his brutish behavior. Jamie comes up with a compromise that keeps Dougal and his men in the fight, but keeps him far enough away from the prince’s sight. What a clever lad, that James Fraser. But the mood turns even more sour when Angus, so concerned with Rupert’s safety, collapses to the ground and dies from internal bleeding. There’s nothing Claire can do for him and he dies, with a saddened Rupert at his side. 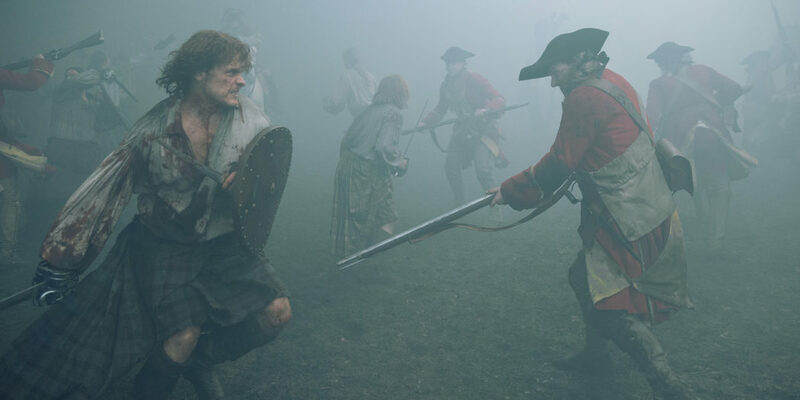 The Jacobite won the battle handedly but Jamie makes the comment to Claire that this is how history foretold things would happen and Claire is beginning to wonder if they can even change the future for their home. But only time will tell if any of their hard work will come to fruition. 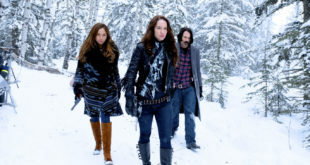 Wynonna Earp is back and better than ever!